ISO 9001:2008 is focused on an approach based on managing the organizational processes and, therefore, a more logical structure, customer focus and the assessment of customer satisfaction, as well as top management commitment to continuous improvement. The new standard ISO 9001:2015 was published On the 15th of September 2015 and on the 30st of September 2015 the Romanian version was published (SR EN ISO 9001:2015). The transition period is 3 years since the publication of the standard (the autumn of 2015). RENAR - The national accreditation body (Certificate SM 004) for the organizations operating in all economic and social scopes (38 scopes), in compliance with SR EN ISO 9001:2008 reference standard. 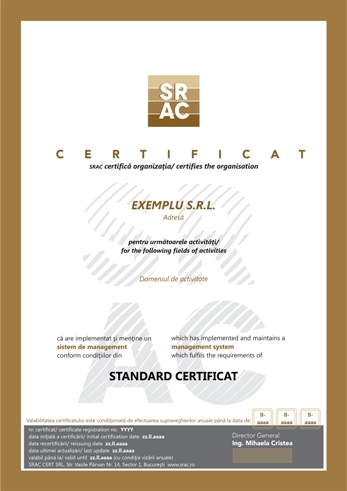 SRAC certifications are recognized at international level through SRAC partnership in IQNet (The International Certification Network). obtain, maintain and improve on a continuous basis its general performances and capabilities; and the strong commitment to achieve the quality is the key. Every organization can build up a safer future, by the implementation and certification of a quality management system - that part of an organization’s management system, directed towards achieving the results against the quality objectives.